This article first appeared in the October 2012 issue of Spinsheet. Get it here! But kids learn by experience. Sometimes experiences teach skills or consequences. Other times, things out of control turn experiences into adventures, and teach about fear, risk, determination and things larger than ourselves. Sailing can provide both the ritual and the experience, and of course, the adventure. So it is simply an ideal instrument of parenting; a way to make great kids. But this article won’t be about the kids. It’s about you. What’s in it for you if you make sailing with kids your family ritual and experience? What if you dropped enough other things – soccer, baseball, the long commute, your mani/pedi appointment – and made enough time, over and over, to go sailing with your kids? Let me start by talking about what family sailing is not. Sailing with kids isn’t a game. It’s a way of being. You might play games while sailing with kids, and it will be fun and frustrating for everyone, as any game can be. But imagine a soccer match where you’re not stuck cheering on the sidelines, but sprint down the field, take a clothesline pass from your daughter and headbutt the winning goal. The crowd goes wild. Daughter hoists dad on shoulders. Well, perhaps that’s a stretch, but you get the point. Moms and dads who sail with kids have a chance to be heroes. And who better? Sailing with kids isn’t dangerous. Not sailing with kids is. The Kaiser Family Foundation reports that American children spend more time consuming media than any other non-school activity, and the result is that most kids won’t develop important problem solving and social skills, and their health and welfare is at severe risk. But as a parent, how does one limit TV or video game time? The virtual world is virtually everywhere right? No. Nothing is virtual on a sailboat. Like a remote island, a sailboat is refuge of reality. An actual place with only real things, like wind, water and people working together to make something from them. 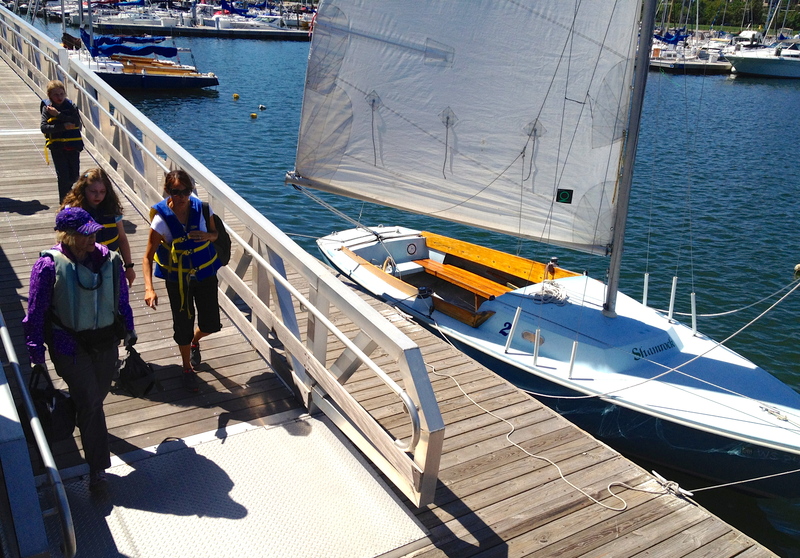 From the parent’s perspective, sailing is the perfect tool to distract from screens and attract to new things. Sail with kids and they’ll be too busy, bored, excited, or happy to miss media. Since there isn’t any available anyway, they’ll inevitably self-determine. They might make up a game or sing for entertainment. Or maybe you will. We often break out Queen’s “Fat Bottom Girls.” And I play a mean air guitar. Most sailors are not role models. Indeed, many sailors are a terrible influence. There is drinking, smoking, cheating, bribery, swearing, and dare I say, even a bit of misogyny in some sailing circles. The first parental instinct might be to run home and pull the shutters tight. The opportunity, of course, is to be the role model; to call bad behavior, to put mistakes in context, to break false gender, ethnic and age barriers, to be judicious and fair, to give not take, to witness reality together in a way that prepares everyone for more reality. Part of life’s adventure is in emerging from dark places and ugly influences healthier, wiser, and proud. I’ve found no place better than aboard a sailboat, with my wife and kids and good friends, to experience this first hand. I can make these claims because every Wednesday and Saturday for nearly two decades my wife and kids and I have sailed together as a ritual. We invite friends, pack sandwiches, check the weather, and go sailing. In thousands of races and thousands of passage miles, we’ve seen thousands of new stories unfold and collected thousands of memories. We’ve seen glassy calm and gales. We’ve cried and laughed out loud. We’ve seen defeat and conquest. We’ve been bored, proud, excited and scared. We’ve faced daunting problems and learned to be calm and make due. We’ve saved lives and made lives. As I write this, I am especially reflective and grateful for the sailing gift. While our family sailing career isn’t over, the ritual was just rudely interrupted by both a planned and an unplanned event. Coming home, our keel met an uncharted object. Kate suffered a minor bruise. Otherwise, no person was hurt, but the boat is in need of urgent care. So with that, Kate is gone, our season is over, and the rest of the team is splitting up. Last Saturday, our younger daughter Elizabeth was invited to trim jibs and kites on another family’s boat, and Angela and I were guests with sailing friends. For the first time ever the Hayes family was apart on a sailing weekend: one at school and the rest sailing separately. For my wife and me, it was a bit like old times; before kids (BK) sailing on other people’s boats (OPBs). But for our kids, I’m guessing, it was a dramatic shift; a ritual interrupted, an all new experience, one grand adventure ending, and another beginning. They’re ready. I know it. And that is what’s in it for you. Nick: I’m trying to reach you by email, but the addresses on this site are bouncing. Could you send me a note with your email info? I have some quick questions that relate to expanded sponsorship of sailing in the US. Sorry, Paige. Not sure why it’s bouncing. Email me at this alternative address: ndhayes1@gmail.com. You are currently reading What’s in it for you at Saving Sailing.